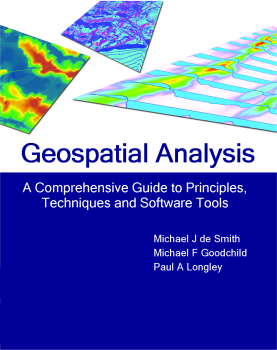 Geospatial Analysis, a Comprehensive Guide to Principles, Techniques, and Software Tools, is a free, online e-book designed to give clear and authoritative coverage of spatial analysis. In that way it’s more of a GIScience textbook than a traditional GIS software-oriented textbook. The content is easily navigated, so it can serve as a strong companion and supplement to any other books or resources used. Great price.